Home > Moth & Spider > Pantry Moth Traps > Moth Trap Reviews > Traps seemed slow, but then ... WOW ! I wanted to write and thank you for making these traps. I have had moths in my pantry for awhile. My kids said they did not want to eat anything in the pantry because of the moths. I had to do something. I called a pest control service and he told me to take everything out and check for the moths. I found moths in a jar of peanuts. I bought your traps and placed one in the pantry. After a few days, I did not notice any moths and thought I had bought a product that was not worth it. But, I left the trap in the pantry and forgot about it. I looked in the pantry today and WOW. I am so impressed with your product I had to send a picture. Thank you for making such an awesome pantry pest product. Pantry Moth Life Cycle - it matters. Be patient if your moths aren't jumping into the trap. The life stage of your moth infestation within the moth life cycle makes a big difference in the timing of your results. Because the moths are a living creature, they don't just line up and fly into the traps until nature tells them its time to make more moths, then they start to follow the pheromone! Learn about the Pantry Moth Life Cycle for a more detailed answer. If your moth infestation is completely out of control, there will be some moths ready for breeding at all times. These are the reviews you might see where a customer opens a trap and within minutes captures a moth. If you have only a single generation of moths, then the 2 weeks out of 6 that they are interested in breeding may not coincide with the day you open your moth traps. But be patient, the traps are proven science and will work, but only when the moth is at the breeding stage of its life cycle. 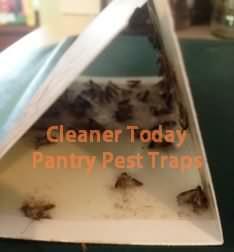 About our Premium Pantry Pest Moth Traps: Amazon, Walmart and other big box stores do not carry our products.